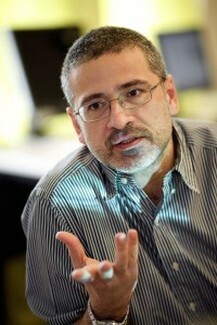 Alessandro Vespignani received his undergraduate degree and Ph.D., both in physics and both from the University of Rome “La Sapienza,” in 1990 and 1994 respectively. He completed his postdoctoral research at Yale University and Leiden University. Prof. Vespignani worked at the International Center for Theoretical Physics (UNESCO) in Trieste and at the University of Paris-Sud in France as a member of the National Council for Scientific Research (CNRS) before moving to Indiana University in 2004. Before joining Northeastern University Vespignani was J.H.Rudy Professor of Informatics and Computing at Indiana University and serving as the Director of the Center for Complex Networks and Systems Research and the Associate Director of the Pervasive Technology Institute. Vespignani is elected fellow of the American Physical Society, member of the Academy of Europe, and fellow of the Institute for Quantitative Social Sciences at Harvard University. He is serving in the board/leadership of a variety of professional associations and journals and the Institute for Scientific Interchange Foundation.